Mr. Paul – Alias Paul G Schuurmans, born and breed in London Ontario.... picked up his first acoustic guitar when he was 18 years old and that was only to impress a girl!! Now a few years later having had fun in Rock, Blues, Folk he has emerged as an accomplished guitarist. Acoustic and Classical guitars are his best companions, add in his harp playing and you can hear him play anything from a diverse repertoire. You may have heard him play at Smales Place, a coffee house here and there or more recently at the London Music Club. Now you will enjoy his talents in the duet of MizA and Mr. Paul. May 2011…. 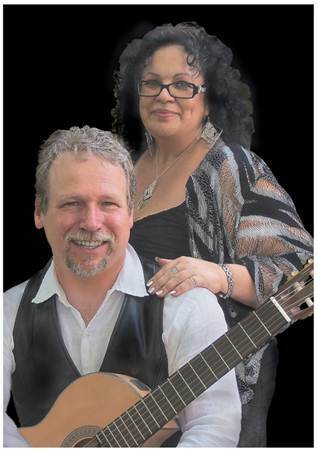 Two performers looking for a partner to complement their talents….. She has personality and smooth vocals…He has guitars, harps and a big smile…..they met, the music started and a new duet was born. Didn’t take long to for their calendar to start to fill up. For your listening and entertainment pleasure, you will enjoy Jazz, Blues, Latin, Folk and Easy listening and more…check out the calendar page to see where they are playing next!